Theommentary – Theological commentary on texts, times, and themes. If someone asked you, How many days in a row have you been faithful to the Lord?, what number would you give? This morning I was reading in Genesis when I came across the Enoch account. It says, “Enoch walked faithfully with God 300 years.” It goes on: “Altogether, Enoch lived a total of 365 years. Enoch walked faithfully with God; then he was no more, because God took him away” (Gen 5:22, 24). Now interestingly, of his total life, Enoch is accounted with 300 years of faithfulness to God, which, incidentally, began at the age of 65 after he had fathered Methuselah. (Methuselah, you will recall, is the one who is credited as having the longest human life in the Bible—or ever!—of 969 years). We don’t know what it was that sparked this “senior moment” of faithfulness for Enoch. Maybe becoming a father at age 65 causes one to reconsider one’s life and the legacy one will leave for one’s child! At any rate, the text is clear that God’s accounting of Enoch’s faithfulness started at age 65! Now as interesting as the beginning marker of Enoch’s faithfulness is, that wasn’t what jumped out at me. It was the number 365—the total number of years Enoch lived. Why? As perhaps many of you, I’ve been reflecting on my goals and habits and thinking about the 365 days ahead. But as I read about Enoch this morning, I asked myself: Could it even be said of me that I lived faithfully for 365 (or at least 300) days in a row? This obviously begs the question of whether one can be counted faithful and yet fall into sin. Protestants and Catholics alike are generally convinced that few can make it through a day without sinning. And to be frank, I have to believe that even good ol’ Enoch gave into to temptation once, twice, thrice in those 300 years. And yet Enoch is credited as having walked faithfully with God. So what’s this mean for us? 1) It’s never too late to start living faithfully before God. We don’t know what happened in the first 65 years of his life, yet the the Bible indicates that Enoch, after 65, was faithful for 300 years. We may not have as long as Enoch to live out our faithfulness to God, but we are never too old to start. It doesn’t matter if you are 6, 60, or 600 (just covering my bases here), you can start a walk with God today. 2) Faithfulness to God isn’t necessarily defined by sinlessness. I’m convinced by the broad witness of the scriptural narratives of the great heroes of the faith, that the faithfulness they are credited with is not based on perfect records of sinlessness. Just take a look at the Hebrews 11 Hall of Fame to see the line-up of sinful characters there! They sinned, and so do we. And of course, theologically, we can never be reminded enough that the faithfulness credited to us is only by the faithfulness and sinlessness of Jesus Christ on our behalf. And yet, we cannot ignore the fact that sinning humans are credited as faithful in the Bible. Here the phrase in Genesis 5 is so important. Remember what it says? “Enoch walked faithfully with God.” Human faithfulness here, and almost everywhere in the Bible, isn’t a statement about sinless perfection, but about walking with God in Jesus Christ. Walking means taking one step at a time, and continuing on, day in and day out. It’s the same word the apostle John uses in his exposition on sin and fellowship with God in 1 John 1. As we walk in the light of Jesus (I John 1:7), it is impossible to say we are without sin or to deny that we have sinned (1:8,10). But as we walk in Jesus, our sins are forgiven and we are cleansed day by day (1:9). You see, we don’t measure the veracity of journey as to how many missteps, slips, and falls we’ve made, but by how we refuse to stop walking. So if you’ve fallen, slipped up, taken a wrong turn—don’t let that stop your journey with God. Keep on walking. Get on the path, ask God’s forgiveness, and move on. 3) Faithfulness should, however, be marked by greater victory over sin. Faithfulness in walking in the light of Jesus means that our awareness of sin should become ever more acute and our tendency should be to deal with it more and more swiftly and with greater resolve to see it killed in our bodies. These reflections all started when I asked myself, Could I, by the help and grace and mercy of Jesus, actually live 365 days without sin? I doubt I will, but that doesn’t mean it is worth setting as a perhaps a goal. This morning I heard about a Saskatchewan man who last January was feeling despondent about his life and he decided to make an audacious goal: To walk across Canada–just because. He wasn’t doing it for charity, but just wanted to see if he could do it. And do it he did. Now don’t get me wrong: It isn’t about justifying ourselves by our sinlessness before God, but it is asking: Can I, with the abiding Spirit’s help, resist that temptation one more day? Can I stay on the path just another hour? Just as the fellow who walked across Canada needed to take one more step—and do it repeatedly—it is worth asking ourselves why we are unable to get through a day, or an hour, without giving in to temptation. I don’t want at all to set ourselves up for disappointment and guilt and shame in failure. However, I do wonder if we—I—tend to give up or given a little bit too quickly. Good ol‘ Google does amazing—and strange—things. Today I discovered that Google was sending several readers toward a 10 year old (!) blog post I had written right around this time of year. Do you remember as a child anxiously and breathlessly waiting for Christmas to come? In my childhood home, we followed the tradition of gathering as a family to read the Christmas story and open gifts on Christmas Eve (followed by stocking stuffers on Christmas morning!). I remember when I was about 8 years old that the wait was particularly difficult. I anticipated and dreamed of getting a Meccano set, though I wasn’t quite sure if I was getting it. So it seemed like torture waiting for gift opening time. However, after Dad’s customary reading of the Christmas story, we were ready to open our presents. I tore into my present and was thrilled with the discovery of my Meccano set! And even though that toy was the source of many hours of enjoyment and learning in months and years to come, I also distinctly remember that by the end of Christmas Day, I had these strange feelings of let-down, or mild disappointment. It wasn’t disapppointment about the gifts—I loved what I had received. But it was that all the anticipation and euphoria was followed by a strange feeling of sadness and even a tinge of emptiness. I’m sure it had a lot to do with how much I worked myself up into an emotional frenzy that made coming down from the euphoria a bit more noticeable to my eight-year old self. C.S. Lewis adopted a German word for this feeling: Sehnsucht (ZANE-zookt). It was a word Lewis used often to describe the deep longings and desires of the soul that were often left unfulfilled. Oxford English Dictionary defines it simply as “yearning, or wistful longing.” It’s a difficult concept to put into words (though Lewis is one of the best to do so), but most of us get it because we’ve all felt it at one point or another. We’ve hoped, and despaired when hope did not play out, often enough in our life that we intuitively understand Sehnsucht. Christmas can be a dangerous and depressing time of year for many. We put so much stock into the season, anticipating that it will somehow be “magical” and deeply satisfying, only to find ourselves with that feeling of emptiness again. It probably doesn’t help either when we find ourselves wondering why many of us don’t have the same excitement or anticipation in the Christmas season as we once did when we were kids. However, rather than seeing the unsatisfied longings that are sparked and dashed often at Christmas, it may be better to ask ourselves what that longing, that wistfulness, is itself pointing to. I’m a bit theologically nervous with Lewis’ last phrase which speaks of being made for another world, even though I do buy into what I think he intends to say. In saying that we were made for another world, we need to be careful not to read into Lewis here a kind of escapism or even a tinge of Gnosticism: Lewis is too careful a thinker to do that. He wasn’t saying that we need somehow to escape God’s creation or that only an escape from this world will satisfy our deepest longings. Rather, I think Lewis’ sense here is more along the lines of Jesus’ own words when he said, “I am not of this world.” (John 8:23). Here Jesus isn’t saying that he does not share our humanity—he most certainly did and does, and Christmas is that time when we affirm that God’s Son took on full and permanent humanity. Rather, he is saying is that the origin or source of his identity and person is not derived from the created world, but from his Father in heaven. Christmas is ironically a time when we hope to see our deepest longings and desires to be fulfilled, only to find ourselves over and over again deeply disappointed. The gifts and family times and turkey meals are all great, and I’m not critiquing those things which can serve up good moments of joy delight. I will shake all nations, and what is desired by all nations will come, and I will fill this house with glory,’ says the Lord Almighty. Hard to believe that the babe in a manger is the one who will shake the nations, and yet he is indeed the one whom the nations truly desire—despite their, and our, unwillingness or failure to acknowledge him as the fulfilment of the deepest desires and longings of our hearts. We tend to be aware of the prophetic significance of the angelic announcement of the birth of Jesus to the shepherds in Luke 2. As Christian readers we are likely to grasp how the announcement was directed to Jewish shepherds who (likely) would have seen it as a fulfilment of Hebrew prophecy. But we may be less attuned to fact that the announcement would have also been heard by Gentile recipients reading Luke’s Gospel as a radical political statement. Both of these aspects are important to understand, so let’s look at them in order. How might a typical Jewish person hear the angelic announcement? And how might a typical Gentile or Greek hear it? “Do not be afraid. I bring you good news that will cause great joy for all the people. Today in the town of David a Savior has been born to you; he is the Messiah, the Lord.” (Luke 2:10-11). From a Jewish perspective, the four words would likely be received as an announcement of the fulfillment of the prophetic hope of the Hebrew Bible. What is the good news? “Here is your God!” It’s no wonder the shepherds went for a look! Saviour – The word Saviour is derived from the Hebrew name “Joshua” which literally means, “Yahweh is salvation.” When the shepherds arrive at the manger side and find out his name is “Jesus” (the Greek version of Hebrew Joshua), the connection of this baby to Israel’s promises of deliverance embodied in Joshua would have been obvious. Messiah – This word, of course, is at the heart of Jewish hopes. The Hebrew Scriptures long predicted the coming of the anointed one. And any Jewish person who was even minimally attentive knew that the Messiah would come from the line and house of King David. Of course, that the shepherds were directed to and found their way to Bethlehem, the city of David, well, that just was icing on the cake! Lord – But just in case the shepherds missed it, the angel of the Lord declared that the baby is “the Messiah, the Lord.” The word “Lord” (Greek, kyrios) here is loaded with significance. As Larry Hurtado points out, the word Lord or kyrios, “had become a widely-used oral substitute for YHWH among Greek-speaking Jews.” I don’t know what language the angels spoke to the shepherds in, but for Luke, there is a clear connection of the identity of the Messiah with the YHWH of the Hebrew Bible. But what about for Gentiles or Greek speaking readers? How would Luke’s record of the angelic announcement resonate with them? Here we need to run through these four words once again, but this time I want to argue that for our Gentile author, Luke, and for what we assume would be in the first instance a predominantly Gentile audience, the words elicit a radical political announcement. Here we must not miss the connection between the opening line (“In those days Caesar Augustus issued a decree . . .”) and the proclamation of the angel of the Lord in Luke 2:10-12. It is easier to see, as above, how this announcement aligns with Hebrew expectation because we are more likely to be familiar with the Old Testament. But it is a bit less obvious to see the radical political implications of the angelic announcement apart from some extra-biblical information that most readers of the Gospel today do not have immediately at their fingertips. Remember that for most Gentiles reading or hearing the Gospel of Luke for the first time, they would have far less familiarity with the Hebrew Bible than, say, Matthew’s readers and hearers. Thus, when Luke provides his account, it is in the context of the historic figure of Caesar Augustus. Thus, the political allusions would have more likely resonated with Greek/Gentile hearers. In short, everything that is said about Jesus by the angel as recorded by Luke was previously directly or indirectly attributed to Caesar Augustus himself. So let’s go through these four words again,but this time from the perspective of how Caesar Augustus would have been understood. Good News – In his book, Divine Honours for the Caesars, Bruce W. Winter draws attention to a decree written by the Proconsul of the League of Asia around 8 BC which extols the virtues of Caesar Augustus—the very same Caesar spoken of in Luke 2:1. At one point, the Augustan decree says, “with his appearance Caesar [Augustus] exceeded hopes of all those who anticipated good tidings [‘euangelia’ – Gospel, good news] before us, not only surpassing those who had been benefactors before him, but not even leaving those to come any hope of surpassing him the future.” (Winter, 37).Historians generally agree that the birth of Jesus took place around 4 BC, which means that the Augustan decree spoken of by Winter had been written just four years earlier. It isn’t hard to see the radical nature, then, of the angelic announcement which declared that the birth of Jesus in Bethlehem was “good news” for “all the people.”We shouldn’t underestimate how this account is a direct “poking the bear” of none other than the mighty Caesar Augustus which just four years previously had been declared to have been the greatest leader ever and with no hope of any coming after who would surpass him. And yet, here came Jesus on the scene, announced as “good news for all the people.”All this to say: The angelic announcement as “good news” isn’t political subtlety, but a forthright declaration of challenge to the Augustan decree! One simply has to say that this was a statement of political boldness at its best! Saviour – A year prior to the Proconsul’s 8 BC decree, there is also evidence that this same Caesar August was declared publicly to be a saviour to the people. On a Priene calendar inscription we find this:“Whereas the Providence which has guided our whole existence and which has shown such care and liberality, has brought our life to the peak of perfection in giving to us Augustus Caesar, whom it filled with virtue for the welfare of mankind, and who, being sent to us and to our descendants as a savior, has put an end to war and has set all things in order” (Emphasis added). Moreover, an inscription from the city of Halicarnassus declared Augustus to be “saviour of the common race of man” (Cited in Winter, 72) and scholars have commonly noted how he was repeatedly called “the savior of the world” and “the savior of the inhabited earth.”The fact that Augustus was issuing a decree, according to Luke, to the “entire Roman world” (Lk 2:1) and that Luke’s genealogy of Jesus in chapter 3 traces Jesus all the way back to Adam (unlike Matthew who traces all the way back to Abraham) indicates that when Jesus is declared to be “saviour”, in a first century Gentile familiar with the honours accorded Augustus as “saviour of the common race of man,” it is beyond doubt the counter narrative Luke is providing for us. No, Luke’s Gospel says, it is not Augustus who is the Saviour of humanity, but Jesus, the man for all people. In Judaism, of course, the anointed one, the Messiah, is clearly associated with the prophetic anticipation of the one to come from the house of David, as noted above. Its noteworthy, then, that Jews were predisposed to be awaiting and looking for the Messiah to come, and in their looking, they were aware that the Messiah was going to be born in “Bethlehem in Judea” (Matt 2:5). So, when Luke then goes on to begin his account of Jesus (right before the genealogy) by recording a birth announcement, the parallel to imperial power cannot be ignored. Jesus cames as Messiah and saviour for all, including all right back to the time of Adam! But Jesus also comes as the one who will be Messiah and Saviour of all to come.Here Winter points to a lengthy resolution passed by the members of the Koinon of the province of Asia. In that resolution, the birth of Caesar Augustus is viewed as the beginning of a new Golden Age and they declared that Augustus’ birthday should mark the beginning of a new calendar year to represent how with the appearance of Augustus, a new world age had begun. Indeed, an inscription to Augustus read: “the birthday of our god marked for the world the beginning of good news through his coming.” (Winter 37). An anointing is a marking, a designating, so here again, it is not difficult to see how Luke’s portrayal of Jesus birth is so closely tied to the decree of Caesar Augustus who himself was portrayed as the harbinger of a new age. And yet it is Jesus, the angels announce, who is the anointed one, and the one who “Today” (2:11) (usually a word used in the Bible connected to the announcement of the present day arrival of the kingdom of God) has come as one bringing joy to all people. Lord – It is as if the best is saved til last with this word. As noted above, the word Lord (kyrios) was clearly associated in Jewish thought with Yahweh, but what about in the Gentile mind? N.T. Wright makes the claim that at the time of Jesus’ birth, “as far as most of the Roman world was concerned, the ‘divinity’ of the emperor was obvious and uncontroversial” (Wright, Paul in Fresh Perspective, 65)Here the full significance of Luke’s record of the angelic announcement comes into focus. Indeed, Caesar Augustus declared his father a deity, thus making Augustus a “son of deity (or as inscriptions put it, “a son of a god” (Cf. the title ascribed to Jesus: the son of God!). It is widely known that the Emperors were commonly acknowledged and honoured as nothing less than deities themselves. In fact, it was because of their divine status as deities that eventually Christians found themselves in trouble whenever they found themselves declaring, “Jesus is Lord!”–but that’s for another post some day! So, the natal announcement plays a dual role for both Jewish and Gentile hearers. For the Jew reading Luke’s account, the angelic announcement encourages them to see Jesus as the fulfillment of all Hebrew prophetic anticipation and as the one to come, the Messiah, the Son of David. But for Gentile hearers, the natal announcement is shot through with political significance and challenge. Indeed, for many of Luke’s readers, the natal announcement is nothing less than a political counter challenge to the highest political authority of their day, namely, the Emperor himself. And so Jesus Christ is to us today: the hope of Israel (Jeremiah 17:13) and the desire of the nations (Haggai 2:7). I just got notice that Christian Book Distributors has a summer clearance sale on many books, including some up to 99% (yes, you read that right–99%!) off. Take a look, you might find something. And of course, Karl Barth’s entire Church Dogmatics! – $179 (US)! Similarly, the word “successful” is not a theological category. So when I say that David Congdon’s little book on Bultmann is successful, I hope I’m not making a categorical mistake. There are at least three reasons why Congdon’s book, Rudolf Bultmann: A Companion to His Theology (Cascade, 2015) should be rightly designated a “successful” theological book–successful because it gives good reason for those who have either given up, or never even looked at him in the first place, to give Bultmann a(nother) chance. 1. Congdon successfully casts into serious doubt, if not demolishes, many of the (mis)perceptions that many have held and taught about Bultmann’s thought. I don’t know which friend it was that Congdon is speaking about who “upon finishing the famous programmatic essay on demythologizing for the first time, told me he kept waiting for the sinister demythologizing he had heard so much about but which never arrived” (xv), but I, too, had a similar experience a year or two ago after reading Jesus Christ and Mythology. Clearly, not everything I had been taught or read about Bultmann is true. That said, let me also say that Congdon’s book will not necessarily transform readers into devoted Bultmannians.That is because defending Bultmann isn’t so much what this eminently readable book is all about–even if Congdon is clearly sympathetic to much of what Bultmann was saying. Rather, the success of Congdon’s book is that he portrays, with great clarity and with excellent primary evidence, a portrait of Bultmann not as one who was seeking to destroy faith–as some conservative critics are still apt to assume–as much as he was seeking to preserve faith in God in the increasingly secularized and scientifically-oriented modern world. Congdon helped me to realize that I need to be much more cautious in teaching others what Bultmann’s program represents. Most important in re-orienting me to Bultmann were the three chapters respectively entitled “Eschatology” (chapter 1), “Dialectic” (chapter 2), and “Self-Understanding” (chapter 4, which in my opinion, was one of the most clarifying chapters of the whole book). For it was in these three chapters that I discovered how Bultmann was locating himself in the 20th century debate about the nature of the kingdom of God (ch. 1); was seeing himself as a faithful participant, together with the early Karl Barth, in the project of dialectical theology (ch. 2); and was seeking to show that “faith understands God only by simultaneously understanding oneself, because the God [we] encounter in revelation is the God who justifies [us]”(60 – ch. 4). Here I have to ask: Does this latter statement not sound a whole lot like Calvin in the opening pages of his Institutes? 2. Congdon successfully makes the case that Bultmann should not be interpreted only through the lens of his associations and disagreements with Karl Barth. Barth would eventually change his mind [after his Romans commentary] about . . . eschatology. In his later dogmatic writings, he grounds the eschaton, and so theology, in the historical person of Jesus, and thus replaces existential theology with a certain kind of christocentric theology. Bultmann, however, consistently develops the theology of Barth’s Romans. . . . If Bultmann remains faithful to the theological position of the early Barth, then it follows that he remains a dialectical theologian, even in his later work. Of course, the question remains whether one is persuaded to follow Barth’s christocentric vs. Bultmann’s existential theological center. But after this, I will follow Congdon in pointing out that Bultmann is actually more consistent in carrying out Barth’s earliest form of dialectical theology than Barth himself. It also illustrates yet another place where there was more change in Barth than he often was willing to admit. 3. Congdon successfully demonstrates that Bultmann, whether one agrees with his approach or not, was not trying to destroy faith, but to understand faith under the conditions of modernity. Once again, we may or may not agree with how Bultmann sought to carry out what is essentially the missionary task of translating the Gospel into various 21st century contexts and cultures, but few would disagree that the task nevertheless needs to be done. Few, if any, believe that we can simply read the pages of the Bible in original Greek or Hebrew to a modern audience and expect them to hear and respond to the Gospel. Yet this is what Bultmann, Congdon argues, was simply trying to find a way of doing. In other words, Bultmann wasn’t trying to desacralize an “other-worldly” Bible into a “worldly” Bible, but was actually trying to highlight the dangers of pretending that we can bring the “other-worldliness” of the Bible into our world without risking the loss of its essential other-wordliness altogether! Let me conclude simply by commending Congdon’s “little book on Bultmann” to you, especially if you aren’t quite ready to delve into his “big book on Bultmann” quite yet. That is my next task…! I’m sorry that I wasn’t able to keep up with the conference postings. We had a number of great lectures and good discussion both yesterday and this morning. However, evening commitments last night and getting back to the airport today prevented me from getting to the summaries. Unfortunately, I don’t foresee having time to finish these up, as I have heavy commitments in the next two weeks. My apologies for those who were waiting for these. 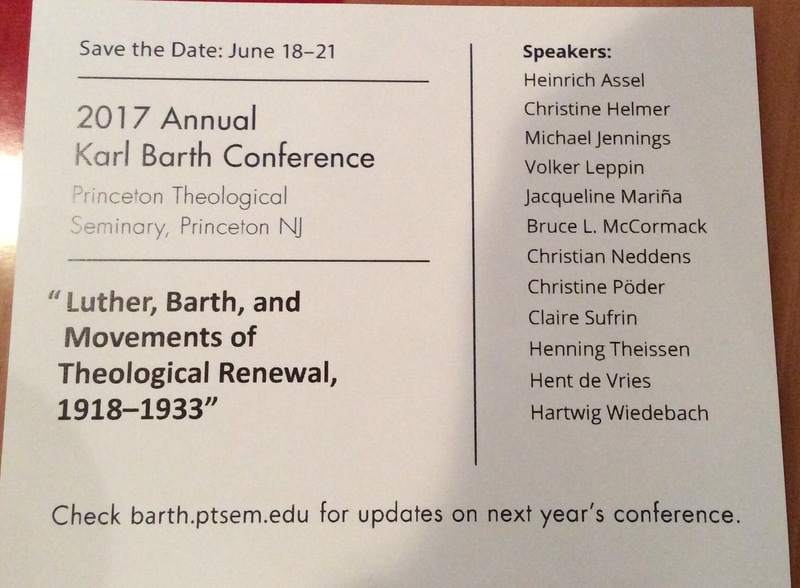 Announcement: It was exciting to hear the announcement for the Karl Barth conference in 2017. Prof. Bruce McCormack informed us that in commemoration of the 500th anniversary of the Reformation (Luther’s 95 theses were written in 1517), next year’s conference will focus specifically on “Luther, Barth, and Movements of Theological Renewal, 1918-1933.” In attendance will be 12 invited scholars from around the world, including three Jewish scholars. The conference will seek to produce original research giving historical, theological, and cultural context of these pivotal “dialectical” years for Barth in his conversations with both Lutheran and Jewish scholars. This conference will undoubtedly be a “big deal” so save the date: June 18-21, 2017.